The Vigerslev train crash occurred on 1 November 1919, when an express train collided at speed with a stopped train near Vigerslev, Denmark, due to a dispatcher error. 40 people were killed and about 60 injured. Vigerslev is noways a part of Copenhagen's western Valby district. Vigerslev train station is nowadays the Hvidovre station of the B-line of Copenhagen's S-tog network. The accident happened to the west of Vigerslev station, between current Rødovre station and Hvidovre station. At the time, the area around the track was farm land. Train number 168 en route from Kalundborg to Copenhagen Central Station was delayed by about 15 minutes due to the heavy traffic on the line. The train consisted of 15 wagons pulled by DSB Litra K 150. It was initially made of two baggage cars, a mail carriage, four two-axle 3rd class compartment coaches, a four-axle 1st class compartment coach, a four-axle 2nd class compartment coach and another two-axle 3rd class compartment coach. At Holbæk, four additional coaches were added at the rear-end (another two-axle 3rd class compartment coach, an old two-axle first class compartment coach, a two-axle third class compartment coach fitted with a heating boiler and a brake compartment and an open-plan 3rd class coach). The last wagon was a well occupied 3rd class passenger car. Most of the carriages were between 17 and 56 years old and only two (the 2nd class coach and the tail-end 3rd class coach) were less than 10 years old. All of them were made out of wood with steel frames. Train 168 was followed by an unscheduled train that carried firefighting equipment to Køge, where it was urgently required to fight a large fire. It was composed of four goods wagons and salon-composite coach Bj 665 pulled by DSB Litra KS 276. This train on its part was followed an extra express train service, train 8064, on its way from Korsør to Copenhagen Central Station. Pulling it was a high speed DSB Class P steam locomotive that could reach 120 kilometres per hour (75 mph). The wagons after the locomotive were a two-axle mail carriage, a four-axle baggage car, two four axle 1st class compartment cars and seven of four-axle 3rd class corridor coaches. Against the timetable, train 168 stopped just after passing Vigerslev station. It was almost 20:50. It later turned out that an 8-year-old boy opened one of the outer doors of the train and fell out. Another passenger pulled the emergency brake in response to that. The train now had to drive back to search for the boy. However, the train dispatcher decided that the train carrying the fire fighting equipment had priority and signalled that the track was free to this train. Train 168 had to wait at the Vigerslev station, the engineer of train 168 was told to look for the boy as soon as the other train had passed. After the train passed, train 168 reversed in the direction of Brøndbyøster station, passing the entry signal from behind. The train dispatcher had only thought about the train carrying the firefighting equipment, and gave train 168 a free path to Brondbyøster. Shortly after he noticed that he didn't think about the express train, and he tried to contact Brøndbyøster station. This was unsuccessful however, as his colleague at Brondbyøster was busy with the throughcoming express train. After the dispatcher at Vigerslev managed to have phone contact with the Brondbyøster dispatcher and made him aware of the danger, he grabbed a red signalling lantern, ran toward the engineer of train 168 and commanded him to reverse. The engineer followed his command, but the steam locomotive accelerated only slowly. Train 168 had only travelled 130 metres (430 ft) from the entry signal at Vigerslev towards the direction of Brondbyøster. The boy who fell off the train had been found next to the track, he had survived with a broken leg. Meanwhile, the dispatcher ran towards Brondbyøster to signal the express train to stop with his lantern. The express train, however, was already nearing rapidly. Although the red entry signals, the red tail signals of train 168 and the dispatcher's lantern were visible to the engineer of the express train, the train didn't brake, as passengers in the train would later testify. On 21:01 the express train crashed into train 168 at full speed. The last five carriages of train 168 were completely smashed, 30 passengers died in these. Parts of the carriages crashed down an 8 metres (26 ft) high embankment. The express train's locomotive and its three front wagons came to a stop on the remains of train 168's carriages. 6 passengers of the express train died, as well as the engineer and the fireman, who died on the site, badly burned by the boiling water escaping from the locomotive's boiler. In total 40 people died, 58 were injured of which 27 badly. 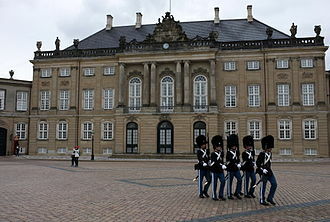 It was the worst railway accident in Denmark in number of victims. The damage to equipment was 1.2 million Danish krone. As the accident took place away from a station, the site was not lit, which complicated the salvage operations. The only light source available were the front signals of the train carrying the fire fighting equipment, that travelled back to the site of the accident. 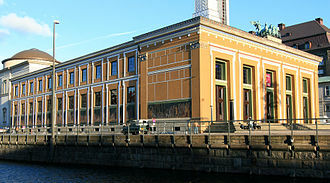 The dispatcher in Vigerslev was sentenced to two months jail time in 1920. The express train locomotive was repaired, upgraded as a class Pr Pacific in 1943 then wrecked in another accident in 1951 when it collided head-on with a DSB Litra R locomotive. One of the driving wheel axles of the locomotive is on display at the Forstadsmuseet in Brondbyøster. Eight carriages in both trains were badly damaged or totally destroyed. Two of them were repaired for other purposes and one of them wasn't scrapped until 2013, despite its coach body having been set aside for preservation in 1995. Despite not directly involved in the collision, the Salon coach Bj 665, preserved in the Danish Railway Museum, saw some role in Vigerslev train crash: it was the tail-end carriage of the firefighting train running behind train 8064. ^ "DSB K 530 blev bygget af Esslingen i 1897". www.jernbanen.dk. Retrieved 2017-07-31. ^ "DSB CC 10803 blev bygget af Scandia i 1916". www.jernbanen.dk. Retrieved 2017-07-31. ^ "DSB BJ 665 blev bygget af Midland i 1868". www.jernbanen.dk. Retrieved 2017-07-31. ^ "DSB KS 276 blev bygget af BMAG i 1886". www.jernbanen.dk. Retrieved 2017-07-31. ^ "DSB P 904 blev bygget af Hanomag i 1907". www.jernbanen.dk. Retrieved 2017-07-30. ^ "DSB PR 904 blev bygget af Hanomag i 1907". www.jernbanen.dk. Retrieved 2017-07-30. ^ "DSB S 9 blev bygget af Scandia i 1892". www.jernbanen.dk. Retrieved 2017-07-31. Christensen, Eigil (1994). "Vigerslev-ulykken". Jernbanehistorisk Årbog. Christensen, Jens C. (1921). Beretning afgivet af Erstatningskommissionen vedrørende Jernbaneulykken ved Vigerslev den 1. November 1919. Dahlberg, Rasmus (2014). Danske katastrofer: atombomben i Valby og andre dramatiske hændelser. Fog, J. (1920). "Jernbane-Katastrofen ved Vigerslev 1. November 1919". Medizinische Folgen der Unfallverletzungen. Fr. Bagges Kgl. 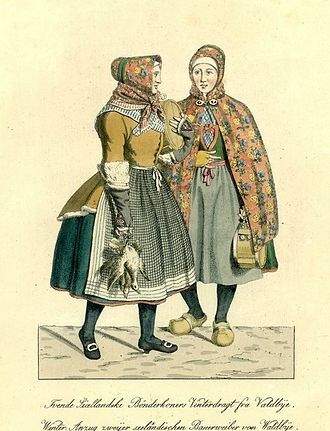 Hofbogtrykkeri. Ousager, Steen (1997). 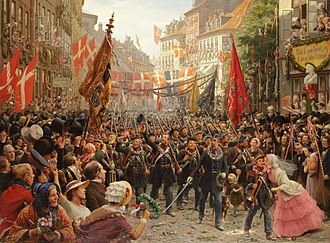 På sporet 1847-1997. DSB Jernbanemuseet. A public transport timetable is a document setting out information on service times, to assist passengers with planning a trip. Typically, the timetable will list the times when a service is scheduled to arrive at and it may show all movements at a particular location or all movements on a particular route or for a particular stop. Traditionally this information was provided in printed form, for example as a leaflet or poster and it is now often available in a variety of electronic formats. A timetable may refer to the information in abstract form, not specifically published. 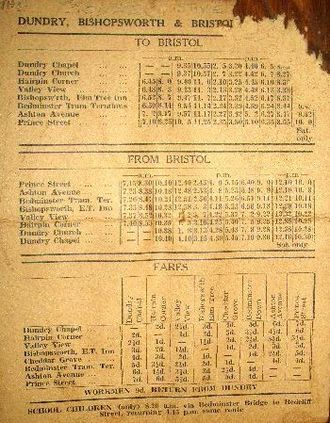 A new timetable has been introduced, the first compilation of railway timetables in the United Kingdom was produced in 1839 by George Bradshaw. 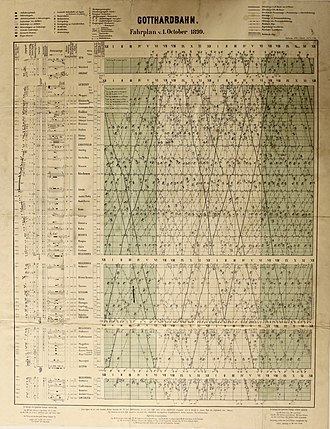 e. Greenwich Mean Time, which replaced solar time, the European Rail Timetable, a compendium of the schedules of major European railway services, has been in publication since 1873. Originally, and for most of its history, it was published by Thomas Cook & Son, although Thomas Cook Group plc ceased publication in 2013, the Thomas Cook European Rail Timetable was revived by a new company in early 2014 as simply the European Rail Timetable. From 1981 to 2010, Cook produced a similar bi-monthly Overseas volume covering the rest of the world, many timetables comprise tables with services shown in columns, and stations or stops on the rows of the table. There will often be separate tables for each direction of travel, generally the times shown against each station or stop will be the departure time, except for the last stop of the service which will be the arrival time. The left hand column will list the stations in order. If the service is scheduled to wait, both arrival and departure times might be shown on consecutive rows, if a slow service is overtaken by a fast service, the slow service will often occupy more than one column, to keep the times in order. There may be additional rows showing connecting services, times are usually shown using the 24-hour clock, but often in the United States and occasionally in the United Kingdom the 12-hour clock is used, with am/A or pm/P added. If services run at the same minutes past each hour for part of the day, Timetables with services arranged in rows of tables and stops or stations in columns are less common but otherwise similar to timetables with services in columns. A compartment coach is a railway passenger coach divided into separate areas or compartments, with no means of moving between compartments. The compartment coach was developed at the beginning of the railway era in England simply by placing a post coach body on a railway undercarriage. Compartment coaches were used across almost the whole of Europe and were right up to the 1930s. On the European continent they were referred to as English coaches or coaches built to the English system. A corridor coach has covered gangways, side entrances and partitioned compartments with a corridor down one side, the first compartment coaches in the 19th century comprised several cabins on one undercarriage, similar to the post coaches. Compartment coaches with doors for each compartment, without any connexion between compartments, were built up to the end of the 20th century, countless four-, six- and eight-wheeled vehicles of this type were used in Germany and especially by the Prussian state railways. Until about 1880, four-wheeled compartment coaches were typical, after the end of the wave of nationalisations the Prussian state railways, around 1895, acquired the quieter-running six-wheelers. For this, so-called norms were established for four-, six- and, for the six-wheelers, both fixed axle and sliding axle designs were envisaged. Those coaches designed specifically for suburban traffic had no toilets, on the other coaches, a gangway was specified in order to keep the number of toilets to a minimum for economic reasons. Numerous coaches had therefore to be converted, after the end of the 19th century, fourth class compartment coaches were procured. Four- and six-wheeled compartment coaches were used in all train categories on main lines. With the advent of the D-Zug express coaches in 1892, compartment coaches were deployed in passenger trains on main lines, so ticket checking by the guard became a function of station staff. By contrast, open coaches were common on branch lines, because there were often no platform barriers on branch line stations, from 1895, especially in Prussia and Saxony, eight-wheeled compartment coaches were built. They were predominantly used in the semi-fast trains or Eilzüge introduced in 1907, over 3,500 coaches were built in several batches starting in 1818. The 4-6-2 locomotive became almost globally known as a Pacific type. The introduction of the 4-6-2 design in 1901 has been described as a milestone in locomotive progress. Nevertheless, new Pacific designs continued to be built until the mid-1950s, the type is well-suited to high speed running. 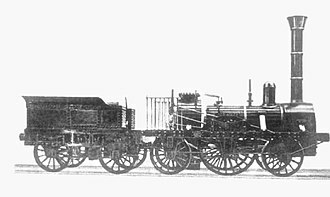 The world speed record for steam traction of 126 miles per hour has been held by a British Pacific locomotive, the two earliest 4-6-2 locomotives, both created in the United States of America, were experimental designs which were not perpetuated. In 1889, the Chicago, Milwaukee and St. Paul Railway rebuilt a conventional 4-6-0 with trailing wheels as a means of reducing its axle load, in 1896, six Q class 4-6-2 tank locomotives were introduced on the Western Australian Government Railways. Even before Baldwin had completed the order from New Zealand, their engineers realised the advantages of the new type, the design was soon widely adopted by designers throughout the world. There are different opinions concerning the origin of the name Pacific, the design was a natural enlargement of the existing Baldwin 4-4-2 Atlantic type, but the type name may be in recognition of the fact that a New Zealand designer had first proposed it. Usually, new arrangements were named for, or named by. In the case of the Pacific, that was the Missouri Pacific Railroad in 1902, the Pacific type was used on mainline railways around the world. During the first half of the 20th century, the Pacific rapidly became the predominant passenger steam power in North America, between 1902 and 1930, about 6,800 locomotives of the type were built by North American manufacturers for service in the United States and Canada. 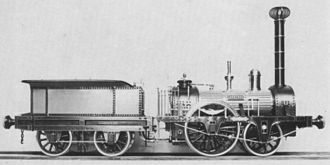 With exported locomotives included, about 7,300 were built in total, about 45% of these were built by the American Locomotive Company which became the main builder of the type, and 28% by Baldwin. Large numbers were used in South America, most of which were supplied by manufacturers in the United Kingdom. Africa was the continent upon which the Pacific was regularly used. The earliest African examples were built in the United Kingdom by Kitson, within a few weeks, these were followed by a German Pacific type that, although already designed in 1905, only entered service in late 1907. At 3,50 a. m. freight train No.393 left Elmira with 55 loaded cars, it experienced steaming problems and at 4,46 a. m. and pulled into a siding at East Corning freight station to investigate. 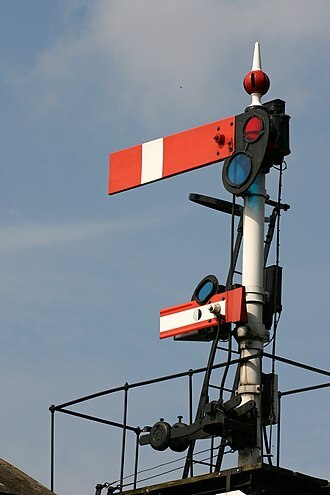 As it was doing so a coupling broke, leaving several cars on the main line, the line operated Automatic Block Signals, the presence of a train in the block section automatically setting the preceding semaphore signals, the first to caution, the next to danger. In addition as it was foggy the flagman placed two torpedoes on the line to protect the rear of the train. Passenger train No.9 running from Hoboken, New Jersey, to Buffalo and Niagara Falls left Elmira at 4,47 and it heeded the signals and came to a halt behind the disabled freight train. The engineer of No.9 decided to assist the freight train, train No.11, an eight car mail express pulled by a Wootten-type engine, travelling from Hoboken to Buffalo, departed Elmira at 5,00 a. m. For some reason the engineer, William Schroeder, ignored two signals, one at caution and one at danger and plowed into the back of No.9 at a speed of 60 mph. All but two of the express cars were derailed and whiplashed, bringing down the telegraph poles on both sides of the track, meaning it was an hour before news of the disaster reached Corning. Meanwhile, hordes of spectators gathered hampering subsequent access by medical, a special relief train arrived from Elmira at 7 a. m. carrying doctors and nurses, but by 9 a. m. injured were still trapped in the wreckage. The inquest heard that engineer Schroeder had appeared drunk the morning of the accident at 12,30 a. m, moreover, he was late for work that morning, appearing only after two men had been sent to rouse him. Schroeder denied being drunk, stating that he had drunk two gins as medicine, the inquest completed on July 17,1912, acquitting the Lackawanna Railroad but holding engineer Schroeder responsible for the crash. The ICC investigation, published on July 30,1912, centered on why No.11 failed to stop, a member of the New York Public Service Commission stated The railroad rules are very strict. Wellington was a small unincorporated community and railroad community on the Great Northern Railway in northeastern King County, Washington. Founded in 1893, it was located at the west portal of the original Cascade Tunnel under Stevens Pass and it is infamous for being the site of the March 1,1910 Wellington avalanche, the worst avalanche in United States history, in which 96 people died. After the disaster, the name was changed to Tye, after the nearby Tye River. Tye was abandoned in 1929 when the second Cascade Tunnel came into use and this ghost town went on to have an elementary school built and named after it. Wellington Elementary is a school in the Northshore School District. The Wellington avalanche was the worst avalanche, measured in terms of lives lost, for nine days at the end of February 1910, the little town of Wellington, Washington was assailed by a terrible blizzard. Wellington was a Great Northern Railway stop high in the Cascades, on the west side of the old Cascade Tunnel, as much as a foot of snow fell every hour, and, on the worst day,11 feet of snow fell. Two trains, a train and a mail train, both bound from Spokane to Seattle, were trapped in the depot. Late on February 28, the stopped and was replaced by rain. Just after 1 a. m. on March 1, as a result of a lightning strike, a ten-foot high mass of snow, half a mile long and a quarter of a mile wide, fell toward the town. A forest fire had ravaged the slopes above the town. The avalanche missed the Bailets Hotel, but hit the railroad depot, most of the passengers and crew were asleep aboard their trains. The impact threw the trains 150 feet downhill and into the Tye River valley, ninety six people were killed, including 35 passengers,58 Great Northern employees on the trains, and three railroad employees in the depot. 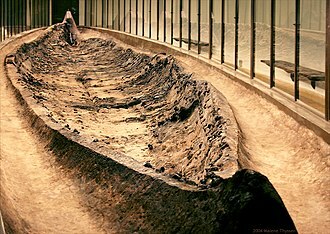 Twenty-three passengers survived, they were pulled from the wreckage by railroad employees who immediately rushed from the hotel, the work was soon abandoned, it was not until 21 weeks later, during late July, that it was possible for the last of the bodies to be retrieved. This was not the only avalanche in the region that winter, three days later,63 railroad workers were killed in an avalanche nearby in British Columbia. A train dispatcher is employed by a railroad to direct and facilitate the movement of trains over an assigned territory, which is usually part, or all, of a railroad operating division. The dispatcher is responsible for cost effective movement of trains and other railroad equipment to optimize physical. From that beginning, a system of train dispatching evolved, Train orders supplemented the timetable and the rule book. Experienced train dispatchers learned the idiosyncrasies of the engineers and train conductors. Initially, train dispatchers issued train orders using American Morse code over telegraph wires, the last train order known to have been issued using Morse code was copied at Whitehall, Montana, on May 6,1982, on the Burlington Northern Railroad. Beginning before World War II and accelerating after it, most major railroads installed centralized traffic control systems to train movements. 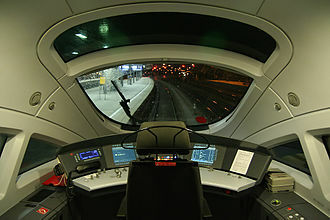 Using CTC, a train dispatcher could align track switches anywhere on the territory so that trains could move into and out of sidings without having to stop, the train dispatcher could control the trackside signals governing the movement of trains. Two-way radios enabled train dispatchers to communicate directly with train and engine crews and these capabilities eliminated the need for most train orders, but still required the oversight of a train dispatcher. Australia - In Australia they are known as Train Controllers, the exceptions being privately operated Railways such as the ones found in the Pilbara region. The mining giants BHP Billiton, Rio Tinto, Fortesque Metals Group and now Roy Hill all operate their own Railways from Remote Operation Centres, Canada - In Canada the train dispatcher is known as the Rail Traffic Controller. The two biggest employers of Rail Traffic Controller are Canadian National Railway and Canadian Pacific, New Zealand - In New Zealand a Dispatcher is known as a Train Controller the same as in Australia. NZRail recently centralised all Train Control into a single Control centre located in the National Capital of Wellington on southern end of the North Island, vince Coleman American Train Dispatchers Association List of railway industry occupations Association of American Railroads Standard Book of Rules,1926 edition. Firefighting is the act of attempting to prevent the spread of and extinguish significant unwanted fires in buildings, woodland, etc. A firefighter suppresses and extinguishes fires to protect lives and to prevent the destruction of property, firefighters may provide other services to their communities. Additional hazards include falls and structural collapse that can exacerbate the problems entailed in a toxic environment, to combat some of these risks, firefighters carry self-contained breathing equipment. The first step in an operation is reconnaissance to search for the origin of the fire, to identify the specific risks. Fires can be extinguished by water, fuel or oxidant removal, the earliest known firefighters were in the city of Rome. In 60 A. D. emperor Nero established a Corps of Vigils to protect Rome after a disastrous fire and it consisted of 7,000 people equipped with buckets and axes, and they fought fires and served as police. 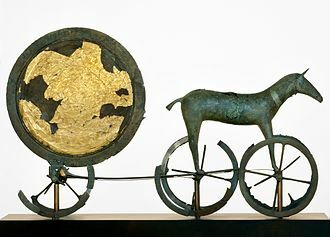 In the 4th century B. C. an Alexandrian Greek named Ctesibius made a force pump called a siphona. As water rose in the chamber, it compressed the air inside, in the 16th century, syringes were used as firefighting tools, the larger ones being mounted on wheels. Another traditional method that survived was the brigade, involving two lines of people formed between the water source and the fire. Typically, men in one of the lines would pass along the full buckets of water toward the fire while in the other women and children would pass back the empty buckets to be refilled. In the 17th century, fire engines were made, notably in Amsterdam, ancient Rome did not have municipal firefighters. Instead, private individuals relied on their slaves or supporters to take action and they would not only form bucket brigades or attempt to smother smaller fires, but would demolish or raze nearby buildings to slow the spread of the fire. However, there is no mention of fires being extinguished, rather they were contained and burned themselves out, ancient Rome did not have an organized firefighting force until the Vigiles were formed in the reign of Augustus. The observation car from the CB&Q's Pioneer Zephyr. The carbody was made of stainless steel in 1934; it is seen here at Chicago's Museum of Science and Industry in 2003. Ottawa Fire Department motor pump, Ottawa, Ontario, taken by the Topley Studio, May 1915. Dynamic display in the central hall at Utrecht Centraal railway station, listing the departures for the next hour or so. The additional lights on Japanese signal 10 show that the points are set for the left route at the next junction. A Finnish distant signal at the western approach to Muhos station is displaying Expect Stop. In the background, express train 81 is pulling away from the station. The driving wheels (boxed) on a 4-6-2 locomotive. The four driving wheels on one side of a 4-8-4 locomotive. A driving wheel on a steam locomotive. A fireman or stoker, sometimes called a "boilerman"
A fireman refills the water tank of a steam locomotive. Former DSB headquarters in Copenhagen. DSB-operated railway lines in 1932. Makeshift coffins laid out near one of two wrecked steam engines. Burned Pullman cars are to the right. The Southern Pacific Esmond wreck on January 28, 1903.